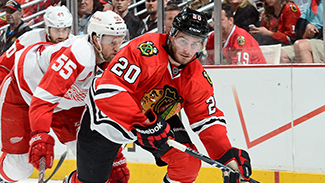 Throughout the 2013 preseason, chicagoblackhawks.com will preview each game with players to watch, notes and more. It's time to get underway, as the Blackhawks open the 2013 preseason with their newly-displaced rivals from Detroit visiting the United Center. Last Season: The Blackhawks went 4-0-0 against the Red Wings last season—Detroit's last campaign in the Western Conference—but three of the four decisions needed overtime or the shootout to decide the outcome. The two teams met in the postseason, culminating in an epic seven-game conference semifinal marathon, in which the Blackhawks rebounded from a 3-1 series deficit to win. Marian Hossa and Patrick Sharp led the Hawks with five points apiece (2G, 3A) in the series. Jimmy Hayes: After spending the better part of the last two seasons in Rockford, the power winger is looking to fill one of the few openings the Blackhawks have at forward, and his production during the training camp scrimmages has definitely helped his cause so far. Hayes has mentioned that he wants to use his size more effectively in games, and tonight's exhibition contest will give him his first shot to show off that ability. Bryan Bickell: Coming off a postseason where he was the Blackhawks' breakout player, Bickell was handsomely rewarded with a new four-year contract, and has higher expectations coming into the 2013-14 campaign. Head Coach Joel Quenneville intimated that the line of Bickell, Teuvo Teravainen and Patrick Kane will remain intact to start tonight's game, meaning Bicks will be charged with driving home rebounds from chances created by the two dynamic playmakers. Jeremy Morin: Another seasoned Rockford veteran hoping to move up a class, Morin's nose for the net and sniping skills have been put on display during training camp. Not only is Morin gifted offensively, but he's shown a willingness to go into the corners and bang bodies with the best of them at the AHL level, and that kind of versatility could prove valuable as Coach Q and his staff put together the opening-night roster. Rising Star (must-watch prospect): Finnish phenom Teuvo Teravainen has been as good as advertised so far in training camp, and has impressed many of the NHL regulars he's skated with through the scrimmages. That he's being teamed with Bickell and Kane speaks to Quenneville's confidence in the young forward and what the organization thinks of his playmaking abilities. Teravainen will most likely head back to Finland before the Blackhawks break camp, but the future is bright for the 2012 first-round draft pick. Know the enemy (opponent report): The Red Wings play tonight's game as the second half of back-to-back contests; they defeated the Penguins 4-1 in Pittsburgh on Monday. Both Henrik Zetterberg and Pavel Datsyuk skated for the Wings in that contest and are slated to sit out tonight's game. New acquisitions Daniel Alfredsson, formerly of the Ottawa Senators, and Stephen Weiss, who previously spent his entire NHL career in Florida, will dress for Detroit, as will defensive leader Niklas Kronwall. Fun Fact: Corey Crawford, who is on the Blackhawks roster tonight, is 11-2-2 with a 1.82 goals-against average in his career against Detroit during the regular season.